Design inspired by current fashion trends. 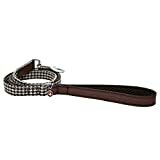 Designer dog lead with houndstooth design. Sizing: length- 40in x width- 1/2in, length- 40in x width- 3/4in.